Ed Sanders race, hosted by NCVC is soon. At least the first one is out of the way, whew. Need to replace the saddle on the Planet Cross. I keep destroying the Titec Ithys Gove saddles I have. Either Titec discontinued the saddles due to quality issues or I'm the real FatMark. I'm leaning towards the FatMark story, sorry FatMarc but you won your race it may time to relinquish that moniker. Speaking of leaning, here's a photo taken by Kevin Dillard of VeloPhotos.net. I've mentioned Kevin before, and I'll keep mentioning him. Great Photographer. Charm City rocked. Great Job to Kris Auer, Chris Nystrom and everyone associated with the race. Fun and challenging course was laid out at Druid Hill Park in Baltimore. It was almost the same as last year except for the addition of a 'prologue' section. I had a 2nd row start and was in the top 4-5 for the first lap. After the prologue section I felt someone rubbing against my rear tire. This ended at the first technical off-camber turn when that person rubbed a little too much and I heard "rider down" behind me. I saw a few racers take turns a bit too fast and slide out. I stayed in the top 15 thru 30 minutes then I started fading. My dismounts and remounts felt smooth. It was a fast course, hard grass with a lot of sharp turns that were silt and dusty. In the tree section the turns had plenty of acorns on the ground to keep you focused on staying smooth. The course had 4 tech sections, 2 man-made barriers, one natural barrier, and one sand pit. Fun stuff. I finished in 19th out of 67 starters in B (Men 3/4). I'm happy with that placing as I was hoping for a top 20. Felt a lot faster than last year so that's an improvement. My finish is better than last year as well. First race and I feel like I have room for improvement as the season progresses. Jeff has the training plan scheduled to have me peaking later in the season. It's good to get the first one out of the way. Charm City is a big race, everyone seems to come out for it, and then the attendance drops. Andrew McK went to the race and did the B race with me, he placed 17th in his first cyclocross event. We may have a roadie to cyclocross convert. Watch out VA B racers, Andy will be tough competition, as will his younger brother Patrick who will vie for the Junior category. Again great job to everyone at C3-Sollay.com for hosting the event. And Nice Job to FatMarc for winning the Masters 35+ B race. Thanks for cheering for me. Thank you to Independent Fabrication and Allez Training Systems for all the help you provide so I can do as much as I can with what little talent I have. And a big Thank You to Holly, Jamie, Kal and Parker for cheering and ringing the cowbells for me. I heard through the grapevine that the Original Owner of the Independent Fabrication Deluxe picked up his bike from the police department today. 5 years after it was stolen, it has found its way home. A guy walks into a bike shop and needs some work done on his bicycle. He doesn't really know what's wrong with it and isn't well versed in the names of the bicycle components. Nothing too surprising here, a shop must see this numerous times weekly if not daily. But this guy had an Independent Fabrication Deluxe with a SID fork and full XTR components and he didn't know what a derailleur was. He couldn't explain why or how the derailleur hanger was bent. I bet bells are ringing in your head, huh? Well, Mr Bike Shop Manager takes the bike, gets the guy's name and number and tells him the bike will be fixed in a few days, just as smooth as as silk. A few phone calls later, Mr Bike Shop Manager knows who the original owner was from Independent Fabrication, lets the local police department know that there is a possible stolen bike in his shop, AND finds out there is a stolen bike report from 2002 from the owner's hometown. The two police departments coordinate their response and have Mr. Bike Shop Manager call the guy to tell him his bike is fixed and he needs to pick it up that afternoon. It seems this guy has some warrants out on him and he is known to be a "runner" by the local police so they have two K-9 units stationed and another set of officers in the shop for the guy's return. Upon return to the bike shop to pick up his bike, the guy is confronted by the police and makes a sound decision not to run. He is handcuffed and taken away. The Independent Fabrication bike was stolen in 2002 and it looked like it hadn't been ridden much since then. It was missing its original wheels and had a bent hanger but other than that, it is in good condition. Hopefully this bike will rejoin its original owner to ride singletrack off into the sunset. Holly is in West Virginia learning how to flyfish this weekend, leaving Parker and I to fend for ourselves. Wish us luck. 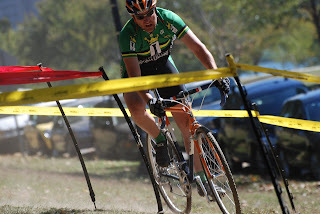 Cyclocross practice will be Tuesday and Wednesdays at Montgomery Hall Park. Tuesdays will be skill sessions and Wednesdays will see friendly races. the course consists of one barrier section, 1-2 railroad tie stairs, off camber grass turns, steep climbs, pavement. A bit of all the good stuff. VACX schedule has been released and will consist of 8 races. Six of them will take place over 3 consecutive weekends in October. Bam. 8 VACX races, 3-4 MABRA races and 1 MAC race will make for a fun season. By now most people know how this year's Shenandoah Mountain 100 ended. If you don't know here's the cliff notes: Jeff Schalk of Trek/VW set a new course record taking 9 minutes off of Jeremiah Bishop's record from last year. Their teammate, Sue Haywood broke her own record, finishing in under 8:12. What is probably more impressive is she was the 12th finisher overall. Oh yeah Floyd Landis was third, coming in a minute and a half after my boy Harlan Price. Team IF had three racers in the top 15, Great Race Harlan, Harvey Minton, and Jeff Whittingham. Great race to all the Indy Fab riders. I didn't ride, I volunteered. First spot for me was course marshalling around mile 12 or 14 at the Tillman-Route 924 intersection. Luckily, I only had to deal with one idiot motorist who was a bit upset that he had to share the road with cyclists, at 8 in the AM. He was looking for an argument, but screw him I wasn't going to give him what he wanted, just smiled and nodded at his inane ramblings. Asshat. After the last rider rolled through that intersection I headed up 924 towards the entrance to Lynn trail. On the way up, Chris Eatough rolled pass me going down the mountain. *wait that's not right*. I stopped Justin who was riding his KTM and he let me know what happened to Chris and an exploding rear axle/hub. After picking Heidi up from her course marshalling spot, we made our way to aid station #5. We helped Chief and his crew set up and then waited. At around 11:55, Jeff Schalk rolled thru, barely slowing down to pick up a bottle. Thirteen minutes later Floyd Landis came thru relaxed and smiling. He grabbed a bottle and soon after his family came by in their van. Justin had relayed Harlan's needs so I had a bottle of HEED and some watermelon ready for him when he got to #5 just 4 and half minutes after Floyd. After the top 3 came through it was quite a while before more racers arrived. I was on chain lube duty, asking riders if they needed some and then setting their bikes to the side of the road while they munched at the buffet. It was great seeing my friends roll into #5. Some were coherent, some not so with it, but everyone seemed in good spirts. Except maybe Shawn T., who had a hurt shoulder. One person I didn't see was James B. I was disappointed that he couldn't make it to full distance but he had to call it a day after his knee locked up. He gets major respect for just starting the race after an Explorer pulled in front of him causing him to t'bone it 4 days prior to the SM100. Sam rode a great race breaking the 10 hour barrier. My peeps from the 757, did it big, check out K-Dawg and Liz's race recaps. Also, check out Gwadzilla's reports, here, here and here. And here. If you haven't bookmarked his blog, do it now. It was great to be a part of such a fine race. I got to see friends, teammates and fellow bikers enjoy incredible trails. Great job to Chris Scott for promoting an epic event. also, Congrats to Chris Eatough for winning the NUE. Harlan was right there coming in second to Chris.